Smokeypugs: Looks like this one has some problems. Will check it this week. Village signs is a series of caches based on the ornate signs that depict the heritage, history and culture of the villages that put them up (normally on the village green!). The signs can be made of different materials from fibreglass to wood, from forged steel to stone. They can depict anything from local industry to historical events. The tradition probably stated in Norfolk or Suffolk and has now spread across most of the country so we thought we would base a series on them! 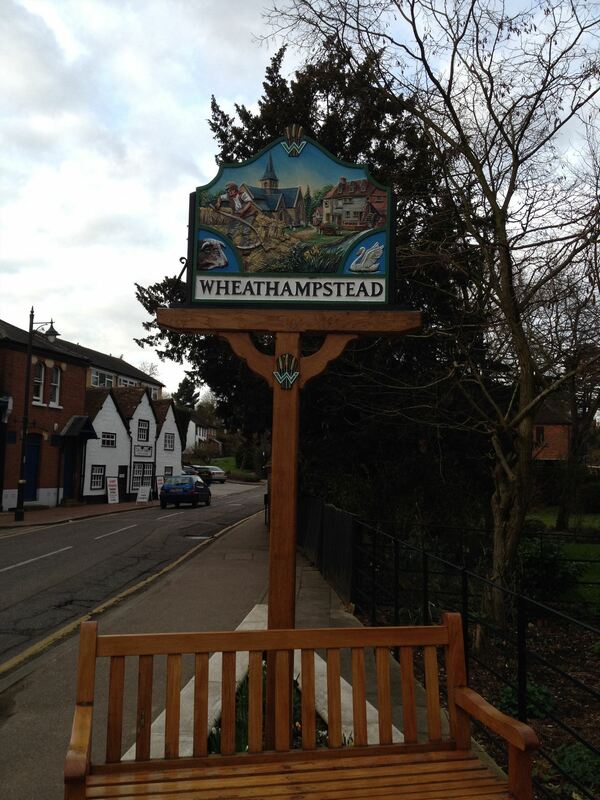 The Village of Wheathampstead can trace its origins back to before the Roman invasion. Evidence to which can be found to the east of the village in the form of Devils Dyke. An earthwork said to be the capital of the Catuvellauni tribe before being defeated by Julius Caesar in 53AD. Wheathampstead is mentioned in the Domesday Book under name . Where it appears their has been a church associated with the village since before the Norman invasion. The church was given to Westminster Abby by Edward the Confesser in 1060. The sign was unveiled on 10th July 2010, Wheathampstead Village Day, by the Mayor of St Albans Councillor Maxine Crawley. The sign was designed by Harry Stebbings and celebrates the 950th anniversary of Edward the Confessor giving Wheathampstead to Westminster Abbey. Down by the river there is a plaque marked "The Mill Quay" and on that plaque is two businesses. The first is based at Bridge Mill between 186A-198B. On the other side of the bridge from the sign is a very old pub. There is a plaque (Part of The Wheathampstead Heritage Trail) where you will find all the other information. There has been a pub on this site since 1D1F.